...and the surprise winner of the year goes to 2 Guns! The only reason I decided to watch this film is because I am a huge Denzel Washington fan, however my expectations for it were extremely low. It's rare, but occasionally, a preview can harm the reputation of a film, and that's what happened here. The previews make this film out to be nothing for than a big gun fight with the occasional cheesy line, but it's so much more than that. In a unique twist, two undercover agents, from two separate agencies, wind up going after the same man. Looking for a way into his organization, they find each other and assume the other works for the bad guy. Both Washington and Mark Wahlberg create characters and put on a good show for the other, having no idea that they're actually working towards the same goal. What really makes this film work is the chemistry between Wahlberg and Washington. Denzel is plays his usual level headed, super intense character, while Wahlberg's playing a laid back, reckless guy, who actually does have some pretty funny lines, that they weren't about to show in the previews. Together they go through on an amazing adventure, full of good guys and bad guy crossing and double-crossing each other. There are at least a half dozen factions tied to this evil man, in different ways for different reasons, and each representative is more unique than the other, leading to some amazing interactions. 2 Guns is the story of 2 agents caught in the middle of a huge conspiracy, that seemingly involves every one. While that may be confusing to some, I found it refreshing, because the truth is you never knew what would happen next. When one side struck, it could have been anyone, for any reason. The unique story and large supporting cast, paired with the terrific chemistry between the two stars, made for an absolute classic that fell under most peoples radars. 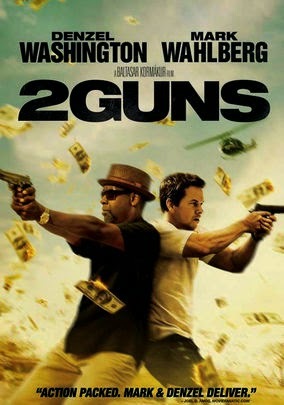 If you're looking for a good movie, that will have you on the edge of your seat, then you should check out 2 Guns! I can't recommend it enough.